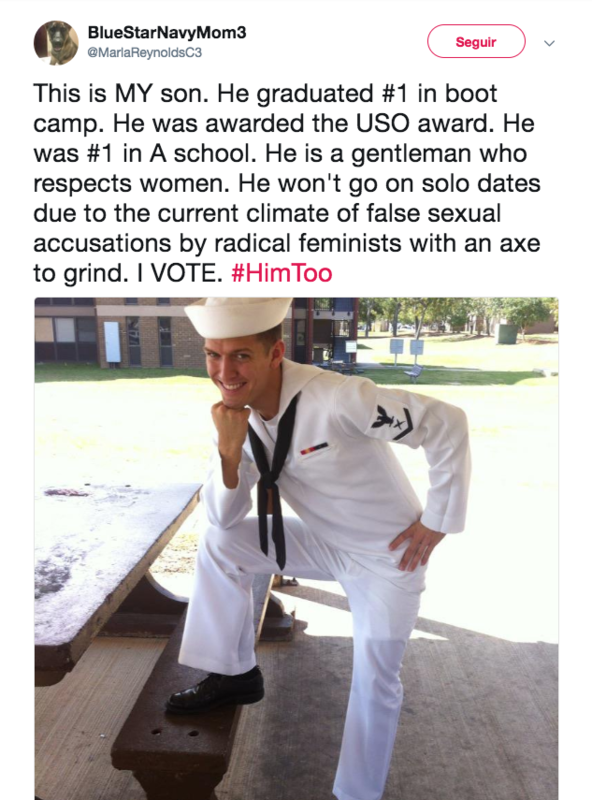 The internet plot twist comes amid a Republican push to energize voters with their own #HimToo angle. In the wake of the sexual assault allegations against now-Supreme Court Justice Brett Kavanaugh, a surge of social media posts using the hashtag #HimToo began circulating to claim that innocent men are regularly falsely accused of sexual misconduct. The trend, a backlash to the #MeToo movement and Christine Blasey Ford’s gripping testimony against Kavanaugh, reached something of a boiling point this past weekend as the final vote to confirm Kavanaugh was being cast. One of the most viral posts came from the mother of a Navy veteran. She claimed that her “gentleman” son no longer goes on “solo dates” out of fear he’ll be wrongly accused of misconduct. “It doesn’t represent me at all,” Hanson told the Washington Post. “I love my mom to death, but boy…I’m still trying to wrap my head around all this.” He explained his mother had a tendency to go overboard on social media, though the post still struck him as surprising considering he had been raised in a progressive household. The initial post, which sparked a slew of parody memes, has since been deleted.